Members work with professional choreographers to highlight the diversity of dance. Member participate in an intensive three-month training/rehearsal. Members show off their talents to the Milwaukee community after camp through our annual dance production. New dance camp participants are required to audition. Please RSVP a spot here. 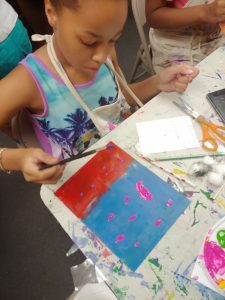 Campers spend the summer engaged in art experiences from multiple disciplines. Participants explore a variety of art-based projects and creative activities with our Teaching Artists.